Remember the name Jack Mthembu, because you will most definitely hear more about this dynamic young entrepreneur in the near future. 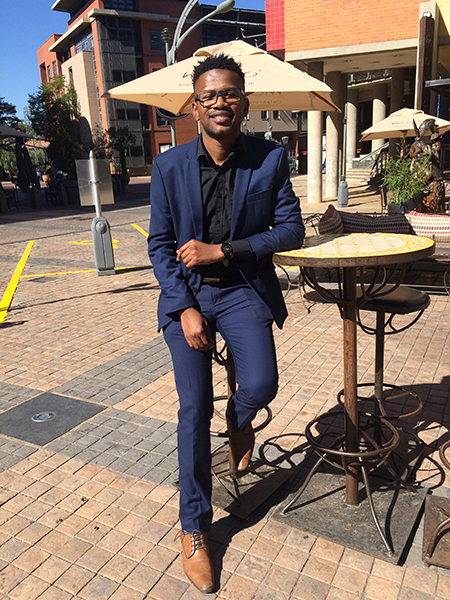 This 27 year-old alumnus of the North-West University’s (NWU’s) campus in Vanderbijlpark has just been included in the Forbes Africa business magazine’s influential annual 30 Under 30 young entrepreneurs listing. The list features up-and-coming small business leaders making an impact on the continent and the world. According to Jack, the founder and chief executive officer of First One Adventures and The Entrepreneurs Club, graduated with a degree in chartered accountancy in 2015. After working as a consulted for six weeks, Jack turned his back on corporate life to pursue his first love: entrepreneurship. His journey as an entrepreneur started during his studies at the campus in Vanderbijlpark, when he was elected as the president of Enactus – an international non-profit organisation that brings together students, academia and business leaders to aid in socio-economic wellbeing. He established both his companies as start-up ventures in 2014 when he was a member of the bhive Enterprise Development Centre (EDC). The bhive EDC is situated in the Faculty of Economic and Management Sciences and represents a hub of entrepreneurial activity. In a recent media interview with the online publication Safrica24.com, Jack said that his inclusion in the list motivates him on his entrepreneurial journey to one day become an African billionaire one day. First One Adventures offers adventure tours, camps and travel packages for young people, especially high school pupils and corporate organisations. Apart from weekend adventure trips, participants are also exposed to developmental programmes. Through The Entrepreneurs Club, participants receive entrepreneurship, leadership and nature conservation skills. The company’s headquarters are in Johannesburg. “But we outsource camps in areas such as Magaliesburg and Bela-Bela in Limpopo,” says Jack, who is originally from Phalaborwa in Limpopo. Jack says he is all about impacting and developing the youth. “Our business is profitable but, really, we are not about profits. We want to shape the world to become a better place,” he maintains.